Are you doing any dedicated Advent reading leading up to the Christmas season? I mentioned in a previous post that I’m reading Ann Voskamp’s The Greatest Gift: Unwrapping the Full Love Story of Christmas this month. Here’s what I read the other day that grabbed my attention. Sit with that for a while. Doesn’t that drill right down into the root of all our worry? When we worry, we’re basically saying, “God, I don’t trust you with the outcome of this situation.” We think that we know what’s best – and we’re not sure it’s going to work out that way. And if God doesn’t do it the way we think it should be done, then we’re convinced it will end badly. Yes, we know in our heads Romans 8:28, that all things work together for good. And we know we should be able to trust God with whatever we’re facing. Yet our human hearts and minds seem hardwired to worry. But, my sweet friends, we can rest in the knowledge that God will get it right. We’ve lived long enough to know that hard times will come. And when they do, we can know that God stands ready to provide for our need. Here’s what Voskamp goes on to say. “In the thin air of Advent, you may not even know how to say it out loud: ‘I thought it would be easier.’ And your God comes near: I will provide the way. You may not even know who to tell: ‘I thought it would be different.’ And your God draws close: I will provide grace for the gaps. You may not even know how to find words for it: ‘I thought I would be…more.’ And your God reaches out: I will provide me. In this season of giving and receiving, there’s no greater gift than God. The original Christmas gift, a babe born in a manger, for the purpose of redeeming the world to God, is ours for the taking. 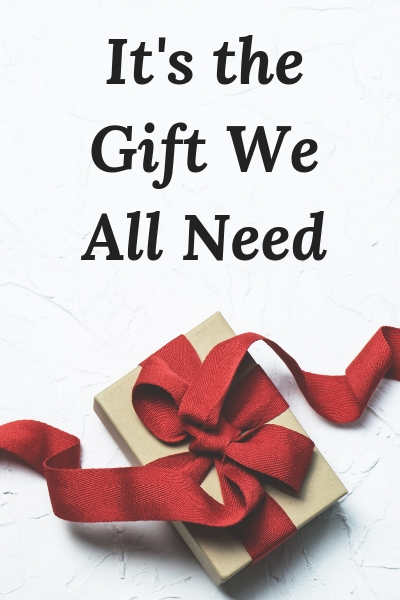 There’s nothing greater we can do than point people to that gift, to Jesus, the One who can meet their every need. No wrapped box under the tree is worth more than what Jesus gives, salvation to all who believe. And I love that phrase “grace for the gaps.” Because sometimes it’s not an overwhelming calamity that I’m facing. It can be a relatively small struggle. But even there, His grace can fill in the cracks, meeting me right where I am. We serve a great God who desires to give us every gift that will be good for us and bring glory to Him. And more of Him is always just what we need. Yes, we’re going through Paul David Tripp’s Advent devotional as a family this month. The reading last night was about how we can sum up Christmas in one word: Jesus. And that’s the only word that can sum up Christmas completely. It was a neat thought! That is a neat thought – and so true!! What a blessing if we can keep that word – Jesus – as our focus this season. For Advent, I’m doing several daily readings: goTandem (goTandem.com) & Plough (plough.com) are my year-round daily devotional reads, and they both have additional specific Advent tracks. I’m also doing Following The Star by d365.org and that Busted Halo one I mentioned last weekend. 👍❤️ I’m going to do a post of the highlights that God has made stand out for me. Just catching up on my blog reading (we’ve been out of town), and I see you’ve posted some Advent highlights! Off to read it now! !